When we were younger, travel was always an exciting possibility. Faraway places were bejeweled with enchantment. We packed light, thought nothing of bone-crunching 15 hour flights and indigestible airplane food. Consider the plight of two older adventurers lost in Rome. We have not planned to be lost in the ancient city, mind you—we meant to circumnavigate Rome and drive toward Spoleto. An easy task, we were sure. But the GPS is buried somewhere deep in the heart of the suitcase and temporarily inaccessible, the written directions confuse, signs are missed, and here we are now plunging into the heart and awful traffic of the eternal city. The problem was that before we reach the second left turn, we find that the directions are not quite accurate, and confusion reigns. Finally, in desperation we appeal to a young man riding a scooter. He starts to give directions, looks at us pityingly (undoubtedly thinking of his own grandparents), then motions to us to follow him. Chasing a speeding scooter through glaring, honking, blaring traffic is no mean feat but we have courage and determination and we want desperately to get the heck out of this mess, and… yes… hooray! Here is the correct turn at last! Soon our road parts company with the main highway and narrows, turns into a dirt road that bumps and meanders until we come suddenly upon field after field of poppies. Their crimson heads toss and dance in the light breeze, and I lean out of the car window to take their picture. But instead of snapping that photograph I stare entranced. 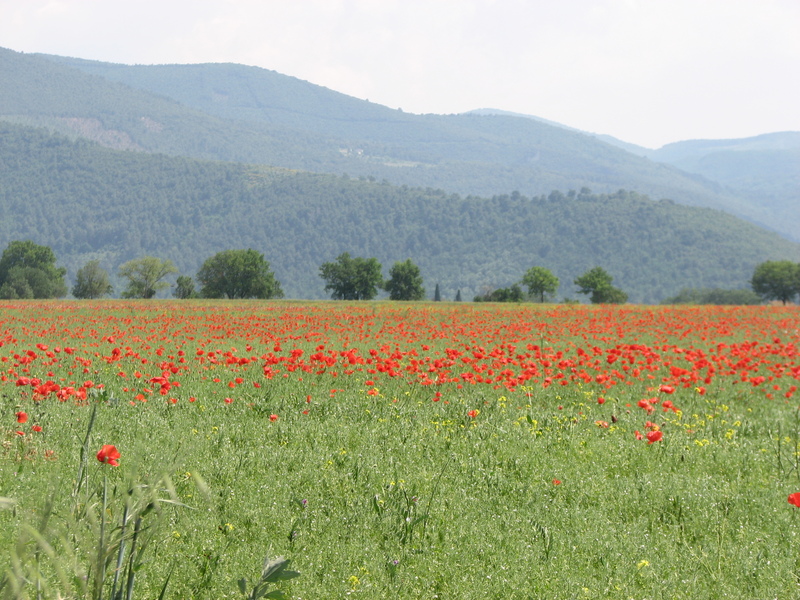 For beyond the poppies rise the Apennines—golden and green and ageless in the afternoon sun. Lovely! Lovely! Lovely! Even though you had some difficulty with directions, it was worth it in the end. Isn’t it wonderful when people come to our rescue? I’m so happy that you and your husband are on such a fabulous adventure. Thanks for sharing. Thank you, Linda! It really is exciting… and so nice to have friends with whom to share the experience! !